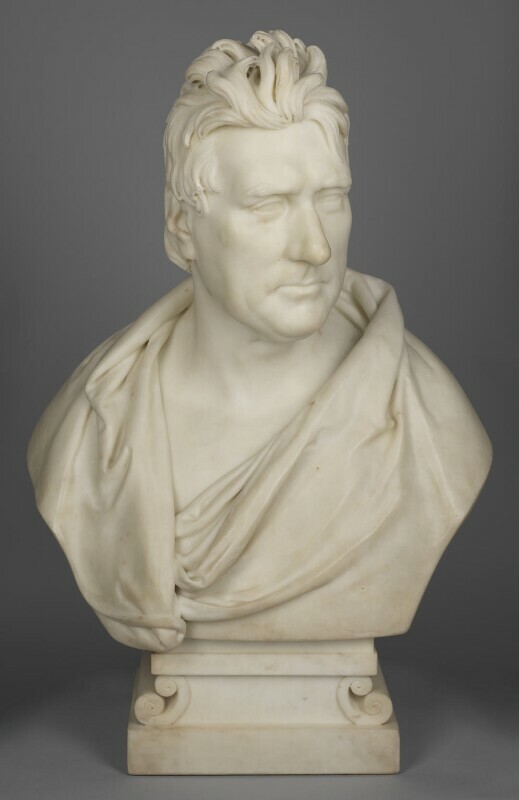 The bust was commissioned in 1818, possibly to mark the completion of Waterloo Bridge: 'Jan 1. Recd an Order from John Rennie Esq. Civil Engineer for his Bust in marble' (Sir Francis Chantrey’s Ledgers of Accounts, p 58). The plaster model is Ashmolean Museum (623-111). The marble itself, finished with some speed, was ready for the RA exhibition in May 1818, described by Hazlitt in 1822 as 'a fine architectural head' (Works, vol.18, p 170). Cunningham called it one of 'Mr Chantrey's finest busts … by many reckoned his masterpiece' (Blackwood's Magazine, April 1820, p 7). Plaster casts are in Scottish NPG (544) the Athenaeum Club, etc. A tracing by Sir George Scharf is in NPG Reference Collection. A marble copy by Henry Fehr 1897 is in the Institution of Civil Engineers collection, and copies were made by Brucciani & Co in 1910. Commissioned by Rennie himself and given by his grandson John Keith Rennie 1881. RA 1818 (1072); Edinburgh 1822; Manchester 1857 (17); 'Sir Francis Chantrey', NPG, 1981 (18). Mezzotint by S. W. Reynolds undated, examples in British Museum and V&A Museum (Alfred Whitman, S. W. Reynolds, 1903, 245); stipple by Thomson from a drawing by Corbould published by Fisher in Imperial Magazine 1821.